Flat roofs are OK if they are built with enough water, cold and snow isolation - and often that is not easy or cheap to do. That's why building a gable roof is often much better, easier and more sustainable. The shape of the gable roof allows the water to quickly fall aside and keeps a nice air buffer for termo-isolation. 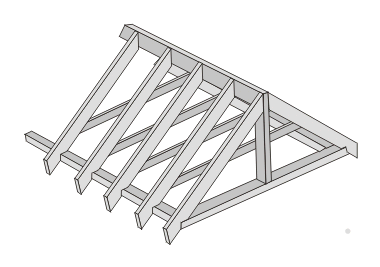 In this guide you will learn how to build a simple gable roof for a shed, barn or garage building. Before building a roof you should have the roof construction (shed, barn, garage or whatever) already done. It's not recommended to build the roof first and then try to match the construction to it. Here's how to build a gable roof. On the top of the building you need to start the roof design. Install thick beams - one beam on each wall, covering its top and at least as thick as the wall is. Thicker is better. Make sure both are vertically aligned by their centers. Attach two vertical joists - one in the center of the beam that will be above the door, and one in the center of the opposite beam. Then one horizontal joist should connect both. Now you need to attach the diagonal laths that you can see on the picture. Near the bottom end of each, there is a small groove which ensures more stability of the construction. Strengthen each triangle with one more horizontal lath during roof installation. Attach it to the diagonal ones, not to the beams at the bottom. They should be placed at about 1/3 of the bottom. At the end your roof needs a coverage. It could be roof materials such as sheet iron or thick plywood for example, attached with nails. At the top, depending on the construction, you can have roof tiles. Building a roof can seem tough, but by following this simple guide you should be able to build a stable gable roof. Tony recommends that if you are building an entire shed you may want to check how to make the foundations first. Make sure the triangle frames are distributed equally on the entire length of the roof. Don't make the gable too high or too low. A triangle like the one shown on the picture should be good enough.